Cozy Chicks: It's all in the recipe! It's all in the recipe! I'm a collector of cookbooks. I have wayyyyyy too many. I love the ones that have beautiful photographs to accompany the recipes. I like to know what my food is supposed to look like (at least according to a well-paid food stylist). 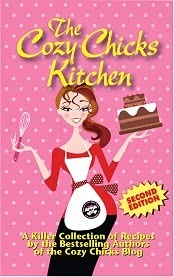 Recently, I edited the latest edition of The Cozy Chicks Kitchen. Man, I have new respect for cookbook editors. It's HARD WORK. I pretty much learned editing recipes from (what I used to think were the hack jobs) of the copy editors who review my traditionally published books. The Booktown and Victoria Square mysteries both contain recipes. I learned that the directions need to follow the list of ingredients. (Nobody told me, I just figured it out after a couple of books and lots of revisions to my recipes.) That all the recipes (written by different people) need to follow the same style. I learned lots more, too, but I've put it out of my mind until the next time I'm called upon to do something similar. Well, not ENTIRELY out of my mind. It's those cookbooks I buy that don't have terrific instructions that remind me what a good recipe is supposed to consist of. Okay, let me clarify, not really cookBOOKs but cookBOOKLETS. Well, that's not entirely right, either. They're little digest size cookbooks that are usually done to promote products or as fundraisers for churches, schools, scouts, 4-H, etc. The recipes in these little booklets vary in quality. For example, the directions for Monster Cookies says: Combine all ingredients together until well mixed together. Watch closely as they will burn easily. Bake about 10 minutes in a 350 oven. Okay...should the cookie sheet be greased? Ungreased? How much constitutes a cookie? Do you roll them in balls? Do you drop them from a spoon? What sized spoon? Million Dollar Cake: Bake in greased floured pans for 30 at 350. Okay...what SIZE floured pans? 8 x 8? 9 x 9? 13 x 9? How about adding those dry and wet ingredients? What's your favorite kind of cookbook? I will be honest - I don't cook a lot. I enjoy cooking if I have company, but cooking for one person is not something I enjoy. But I do have a LOT of cookbooks and individual recipes. I see something and think - that would be great - but then I never make it. My favorite cookbooks, though, are really old ones that were my grandmother's, then my mother's, and now mine. I love just reading the old fashioned instructions and looking at the pictures. But there are a few of those recipes that I do make. There is a biscuit recipe that my mom and I would use to make cinnamon rolls that are to die for. I haven't made them in yeas, but just thinking about them makes me want to get the recipe out and make some soon. And your comment about instructions not being clear reminds me of the time I decided to make my mom's BBQ rib recipe a few years after she passed away. The recipe had things like "1 bottle of catsup" - but what SIZE bottle. Catsup bottles are a lot bigger than they were when she wrote the directions down for me. And other ingredients were "to taste". Do you know how bad BBQ sauce tastes before it's cooked? I was actually proud of myself because I managed to make a good sauce (and wrote down specific instructions as I did it). I have about 10 medium size shelves full of cookbooks. Mmm, then there are 1950's train cases full of 1950's product pamphlets for Oster, Gaffers & Sattler, (ooh) Wedgwood,and Hamilton Beach. Plus,I have a supply of "ancient" and more recent brand name recipe pamphlets like Knudsen, Biscquik, Philadelphia Cream Cheese, and Sunmaid. One of more fascinating cookbooks I have is Encarnacion!s Kitchen, a combined Early Californio recipe book with social commentary. Sometimes I just read my cookbooks to relax. Cooking is one of my favorite creative endeavors. I love all kinds of cookbooks - the big Betty Crocker or Better Homes & Gardens as well as quirky cookbooks, the ones like you mention unique to an event or town, the pamphlets from my appliances (and I usually order the cookbook), product-specific books (Pace Picante Sauce, for example). I save recipes I find online, tear them out from magazines, have many of my mother's old cookbooks and handwritten notebooks and recipe cards, a handwritten notebook of recipes from when I was about 11 years old . . . of course I will never make recipes from all of them but they are fun to read. I have a couple of binders from the mid-70's from McCall's Cooking School - 8 x 11 cards, step-by-step instructions and color pictures front and back. Old fashioned recipes with a lot of steps and techniques and a lot of work, not too healthy by today's standards but taste great. Every once in a while I will pull one out and use it. My mother and grandmother taught me to cook so most of the time it is still by taste and "eyeball." If it is a cookbook it is my favorite! However, a new rule I apply is if there are not ten things I would make and eat by half way through, it stays on the shelf at the store or flea market! I love old cookbooks, too, and I really like cookbooks with little stories about where the dishes were served, any special tips on preparation, etc. I hope Lynda makes those cinnamon rolls and posts a picture! I love reading cookbooks. I have ever since I was young. I only have a few of my own, but my mother's collection fills a large bookshelf. I love cookbooks that have big, beautiful brilliant photos, like Martha Stewart's or Julia Child's cookbooks. I also love cookbooks that tell a personal story, like The Blueberry Hill cookbook, a cookbook of a couple who opened a bed and breakfast and shared their recipes. That cookbook is small and simple (the size of a paperback book) with no large color photos, but it is one of my favorites. On another note, I have been dying to try that candy recipe from one of your Booktown mysteries...the one with the saltine crackers covered with melted sugar and chocolate. I have been wanting to try that ever since I read the book! I like fun cookbooks, nothing fancy. 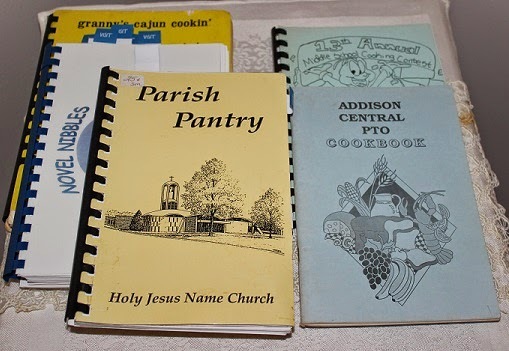 "CookBooklets" are great, especially the older ones, they have a history that's fun to learn. I try to make at least one recipe from each mystery I read, sometimes more. Love the two cookbooks from the cozy chicks! My mom used to make sweet barbeque sauce with a little of this and a little of that. I made it the same way for a long time. Sometimes it was as good as hers, sometimes it wasn't. Mr. L decided to experiment and he came up with actual measurements. Now it's delish every time. I buy those 1950s product pamphlets whenever I can, and usually for a quarter or less. For a while I was giving them away in a weekly contest. I wonder if you guys would be interested in something like that? My first cookbook (when I was 12) was a Betty Crocker cookbook. It's still my old standby. When I need to know something, I open that book. I wasn't interested in old cookbooks until I started writing about the Cookery in the Booktown Mysteries. Uh-oh! Now I have a BUNCH of them. They're fun to read, and lots of times they have very simple ingredients that you probably already have in your pantry. Win-win! The cracker toffee candy is incredibly easy to make and incredibly easy to eat (and eat and eat). I only make it at Christmastime because ... I eat and eat and eat it until it's gone. Since I make other stuff at Christmas, maybe I should make it some other time of year. I might enjoy it even more! You're on! As soon as you unpack them all, I'll count mine. It would make a great blog post! I have some old cookbooks that were my Mother's and Father's. Yes, my father was a good cook too but not a good cleaner upper. I also have a lot of those cookbooks from Clubs, Churches and other organizations. When I moved, I had to get rid of a lot of them.. I only kept enough to fill two shelves in a small bookcase in my kitchen. My favorite one is a Good Housekeeping one from the 40's. It was my mother's and the first one I had. The cover is missing and some of the index. I don't look in it much now but I just can't part with it. I also have a Julia Childs one that was my Father's. He was more into gourmet cooking. Mom was just plain old fashioned cooking. More my style. . YES I can say that I definitely would be interested!! Mr. L has the cookbook his mother used for years. (I believe the copyright is 1939 -- the year she got married. Maybe it was a wedding gift!) He's a wonderful cook, but lately we eat the same old same old every night ... we both love to read cookbooks, but ... are lazy. I love those old pamphlets. I only have a couple of them but, they are so much fun to read. I pulled one out when I had some friends over, and we laughed so hard at the "tips" for women. Hilarious! The only cookbooks I had when first married were The Kate Aitken Cookbook ("Canada's Favourite Cookbook") and the Metropolitan Life Cookbook. I didn't know anything about cooking, so the Kate Aitken book wore completely out. I should have hung on to it, anyway, as now it is a collector's item, apparently. Replacing it would be costly. In any case, I am at the stage of life when paring belongings down is really best. I have given most of my cookbooks away and kept only a few. My grandmother's recipes often left an ingredient out, most often didn't give directions because she had it all in her head and amounts were of the pinch of this and that variety. She was a good cook and her pastry was the best. My mom followed recipes to a T, in fact was obsessive about it. I remember thinking when I read that recipe that I would like to try it, but then I got sidetracked (not hard for me to do!). Which of the Booktown mysteries was it in? I think I need to look that up and try it. First of all Lorraine, there is no such thing as too many cookbooks. It's like saying I have too many mystery books or I have too many romance books. No one ever says that. I love cookbooks, especially regional ones. I collect cookbooks on my travels. The recuperate a lot about the people in the area. While I have some of those cookbooklets, I stick to my Better Homes and Gardens cookbook I got when I was 13. I have a few others but don't cook too many new recipes. I've had to wean myself from adding more to my collection---okay. I'm TRYING to restrain myself! (Have them in the kitchen, study, den and bedside table. (Probably under the bed too) I've twice re-covered my old JOY OF COOKING I received as a briadal shower gift several, um, decades ago! I'm also partial to community and Junior League cookbooks. In all our travels, and when anyone asks what to bring back, I usually request a local cookbook. I even wrote a cookbook of favorite recipes from family and friends in 1982. So I guess you could say I'm addicted. Funny thing is I always tweak recipes, and just basically use them as guidelines, and to remind myself of what I haven't fixed for dinner/parties etc. in awhile! Would hate to part with any, though! I like the way you think, Annette. I like the Junior League cookbooks. My favorite is Cotton Country (from eastern Louisiana)...and my favorite misprint is from the King's Ranch Chicken recipe inside it...that...even printings later (and editions later)...says that the corn tortillas need to be put in the stock until they are "ozzing" (not oozing) with stock. I get a kick out of that every time I make it.